Congratulations to our Scottfieldians on a great Octoberfest Horse Show!! What a fantastic way to end a super show season! Congratulations to Jennifer and Brian Norris on their selection of the athletic 4 year old Morgan mare, Someone Like You! 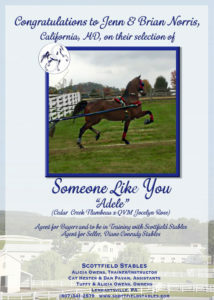 “Adele,” as she is so cleverly named, is a beautifully bred park harness mare who is by the many times world champion park horse Cedar Creek Flambeau and out of the equally decorated Centerpiece daughter, QVM Jocelyn Rose. We look forward to preparing this special mare to be Jenn’s amateur mount down the road, and are thrilled to add Jenn and Brian to the Team Scottfield Roster! Welcome to the Team, Norris Family! 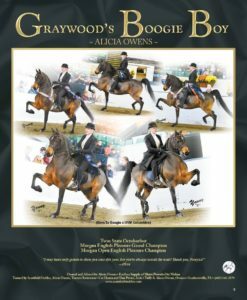 For more than 35 years The Grand National & World Championship Morgan Horse Show has represented the pinnacle of achievement in the Morgan Horse world. It is held mid-October each year in Oklahoma City to permit equal access for exhibitors from all parts of the country. More than 5,000 Morgan enthusiasts attend the show at the Oklahoma State Fairgrounds. 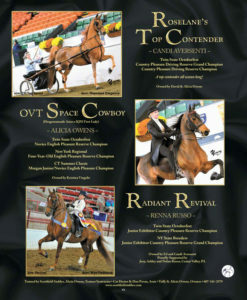 This year, the show will offer over $300,000 in prize money and awards to the owners and exhibitors of the over 1,000 horses competing from 45 states and 4 nations. The first Grand National & World Championship Morgan Horse Show was held in 1973 in Detroit, Michigan. The show was held in Detroit again in 1974. Oklahoma City, Oklahoma became the current home of the show in 1975. Scottfield took 5 show horses to the Grand National this year, and were joined there by Scottfield riders and owners from New York, New Jersey, Pennsylvania, Virginia and Maryland. Kicking off the show on the first Saturday morning was Audra Lee and her 7 year old Morgan Mare, CBMF Random Hearts. 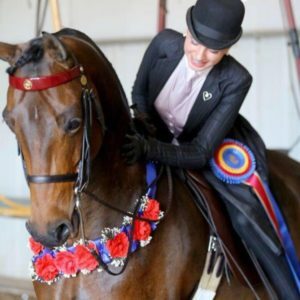 Audra and Heart have been competing together since 2014, and came into the show the two time defending World Champions in the Junior Saddle Seat Equitation division. 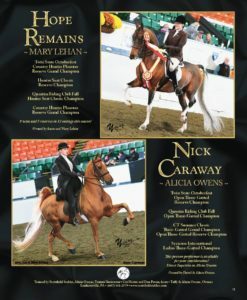 At this show, Grand National Championship classes act as qualifiers for the World Championships classes held later in the week. With a super rider on Saturday morning, Audra and Heart were the unanimous winners amongst the 3 judge panel to earn the 13 & Under Saddle Seat Equitation Grand National Championship blue! 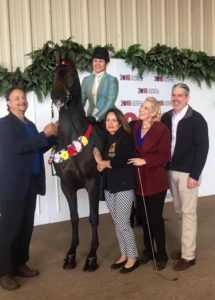 Not to be outdone and with the support of all of her cheering barn mates, Sarah Hecht piloted her incredibly talented Morgan Gelding, Dragonsmeade Varvatos, to the 15 & Under Park Saddle Grand National Championship win. Sarah and Varvatos have enjoyed a phenomenal show season, being undefeated in 12 out of 14 showings with Reserve Championships filling the other two spots. Sarah is a fierce competitor in that she simply doesn’t get nervous to show and can execute any plan on any horse. 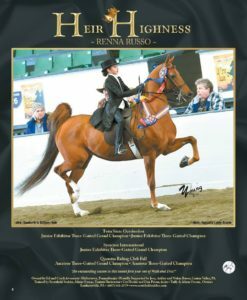 This year alone she took home two world championship titles on two different horses in two different breeds, a rare accomplishment in the Saddlebred and Morgan breeds. 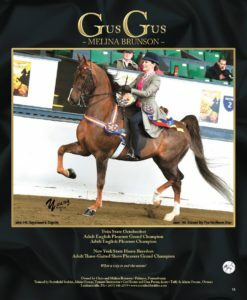 In August, Sarah and her 5 Gaited Saddlebred Mare, Novella, won the 13 & Under 5 Gaited World Championship unanimously at the Kentucky State Fair & World Championship Horse Show in Louisville, KY.
With superior ringmanship and a horse that is a beautiful standout in any field, Maddie and her beloved Morgan Gelding, MEM I’m Back, were brilliant to win the 14 Year Old Hunter Pleasure Grand National Championship on Sunday afternoon. This team has only recently moved to Scottfield, making the decision to move in August when Scottfield hired their long time trainer, Dan Pavan, to be one of two assistant trainers at Scottfield. 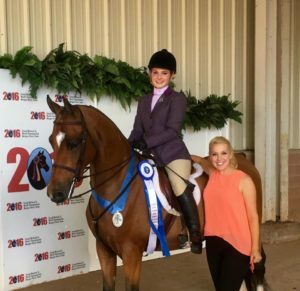 Maddie and “Ricky” have been a natural fit for the Scottfield program, being undefeated at the Quentin Fall Classic, and Grand National Champions in their first performance class at Oklahoma. Maddie’s upbeat attitude and tremendous love for her often difficult horse are only two of the things that make this team so fun to work with! Special thanks to Dan Pavan and the entire Sappenfield family for having faith in the Scottfield program and embracing this exciting next step in Maddie’s career. After having a few days off of showing in the middle of the week, each of these three teams came back to their championship ready to face a new field of competitors in their World Championships. Both Maddie and Sarah compete in younger age groups and had to return to their championships going up against the best horse and riders from the older age groups. But that didn’t stop these two young ladies!! Varvatos and Sarah returned to the show ring on Friday morning ready to challenge the best juvenile Park Saddle horses in the country. With one of the smaller horses in a class that definitely favors the taller equines, our strategy was intricate and involved a long list of maneuvers around the show ring that would create the illusion that our smaller horse was keeping up with the larger ones without sacrificing our horse’s incredible park trot, (which is supposed to be slow and high, and not racing to grab more animation). Sarah was masterful in the execution of the plan and was rewarded with the Reserve World Championship in the 17 & Under Park Saddle class — no small feat for a little horse and his 13 year old rider! While Sarah has enjoyed many great show horses in in her career to date, we all agree that there is something special about this particular team. When you have a horse this good, the end of show season is always sad, but what an incredible season these two have shared! Though she started the week a little bundle of nerves, Maddie’s confidence in her horse and herself improved with every good ride she had during the week and by the time her World Championship rolled around Friday afternoon, Maddie was not just prepared to march in to the deep field of 18 riders vying for the World title, she was excited to storm the gate! The first one down the chute and into the ring, Maddie and Ricky made their intentions known from the very first pass, and the crowd quickly got behind this gorgeous team. With one smart move after another, and each pass better than the last, this pretty pair rose to the top of the pack to be crowned the Reserve World Champions 14-15 year old Hunter Pleasure, collecting a first place vote from the three judge panel along the way. With her arms wrapped around her special horse, and tears in her eyes, Maddie made her way down to the winners circle to collect her tricolor. This year at Oklahoma, Audra Lee and her mare, CBMF Random Hearts did something that has never been done before, but in order to understand the significance of it, let me share with you the backstory. 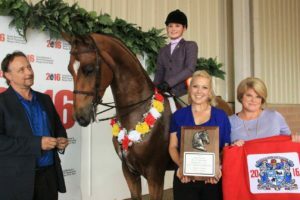 When Audra Lee and CBMF Random Hearts won the Junior Saddle Seat Equitation World Championship for the first time in 2014, Audra was 11 years old and Heart was only 5. 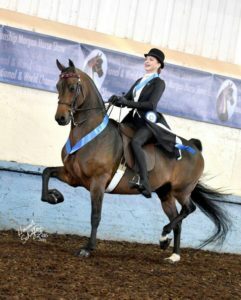 The pair had given up their final year of walk and trot eligibility to step up into the older age group, and Heart had only been shown twice prior to Audra taking over the reins in 2014. That previous winter, I equitated the young mare and used our school horses to teach Audra her patterns. When they won in 2014 unanimously, I was over the moon! The 2015 season was another good one and as we approached Oklahoma, we were excited to try to defend our title. And we did. When we realized that only two other riders had ever won that title twice, we were doubly proud! But before her second consecutive world championship victory pass was even over, people began talking about the opportunity for a three-peat, which had never been done. And every day for the last year, that has loomed over our heads. We would mention it to one another on a rare occasion here and there, but for the most part, it was an elephant in the room and we did everything we could to not talk about it and stay focused on the most immediate goal, which was always our performance at the next horse show. To say we felt pressure would be a gross understatement. It felt like if Audra didn’t win it this year, it would take away something from all of her prior accomplishments. On the second Saturday of the World Championships, Audra and Heart did it. They unanimously won the Junior Saddle Seat Equitation World Championship for the third year in a row, the first time in the 44 year history of the show that it has been done. Audra was beyond happy. I, her trainer and instructor for the past 7 years, cried for 20 minutes, overwhelmed by an interesting combination of relief and gratitude. I told Audra before the class that she had already given me so much, that she didn’t owe me this win. Neither did Heart. I wanted her to ride that ride for her and her alone. I am so very very grateful for the opportunity to work with this incredible team and feel tremendously blessed to have the Lee family in my life both personally and professionally. I am beyond blessed. While the Grand National and World Championships won by these three riders were incredible, every ribbon won out there is a hard fought one, and I would be remiss to not also congratulate Tallulah Uptown (shown by yours truly) and her owners Tim and Kris Lee, on their beautiful mare’s top three finish in the Open Hunter Mares and the Ladies Hunter Mares Grand National classes. Also congratulations to Carley Pavan, Deb Pavan and Maddie Sappenfield, all of whom put in great rides on KHF Nikko Blue in his last trip to Oklahoma, and helped him achieve two more top 5 finishes to add to his illustrious record. Special thanks to Sue Pavan for all of her work throughout the week, to Deb Pavan for being the best aisle keeper and pal a girl could ask for. To Lory Kielceski and daughter Kate– you are always there for the big moments, and we all know that every big first I have ever had was because I had you guys to show me the way. And a shout out to Cat Hester, our Assistant Trainer who stayed back in Lenhartsville with the rest of the staff to keep the 40 horses at home all working and good order as we look forward to our next show. You are amazing, Cat!! I couldn’t do what I do on the road if the horses weren’t always in good order upon my return. Thank you!! And BIG Congratulations to everyone on an incredible 2016 Wold Championship horse show!! 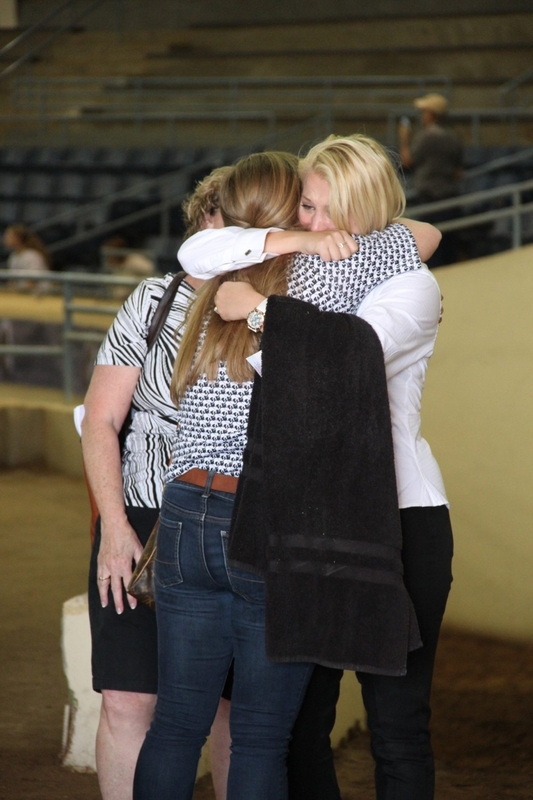 Kate Kielceski and Trainer Alicia Owens share an emotional hug following Audra Lee's history making three peat win of the Junior Saddleseat Equitation World Championship. Kate was Alicia's very first student when she opened Scottfield in 2003. 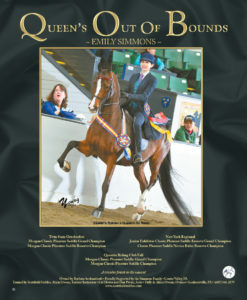 Kate was also Alicia's first World Champion Equitation rider, winning both the AMHA Gold Medal Finals and the Senior Equitation Reserve World Championship in 2011. 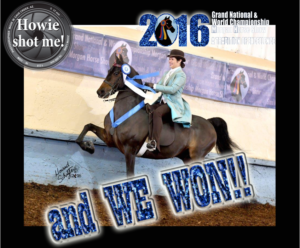 Kate flew in to cheer on her Scottfield Family at this year's Grand National along with her mother, Lory Kielceski. Family Fun Day at the Farm a Success!! October 1st might have been a bit overcast, but that did not stop more than 200 people from coming to Scottfield Stables for our first Open House! With pony rides, fishing, riding demonstrations, hot dogs and hamburgers on the barbecue, cotton candy and popcorn, giveaways and more, the day was a great success!